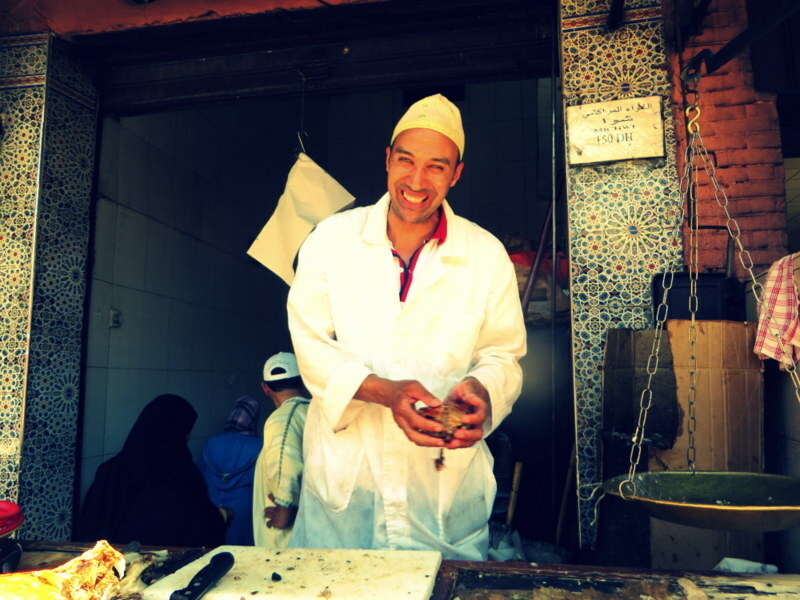 I wander through the medina’s chaotic streets, my stomach growling with hunger. 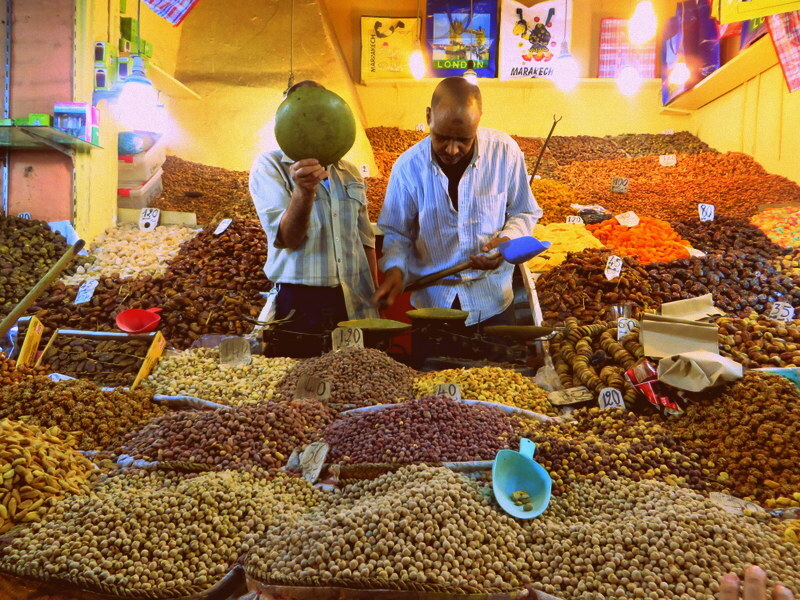 Vendors constantly surround me trying to get me to buy rugs, argan oil, and vibrant spices. Old women clutch my clothing asking for money. One man even chases me around the square, trying to shove a snake in my face. I stop for none of it. I take no pictures. 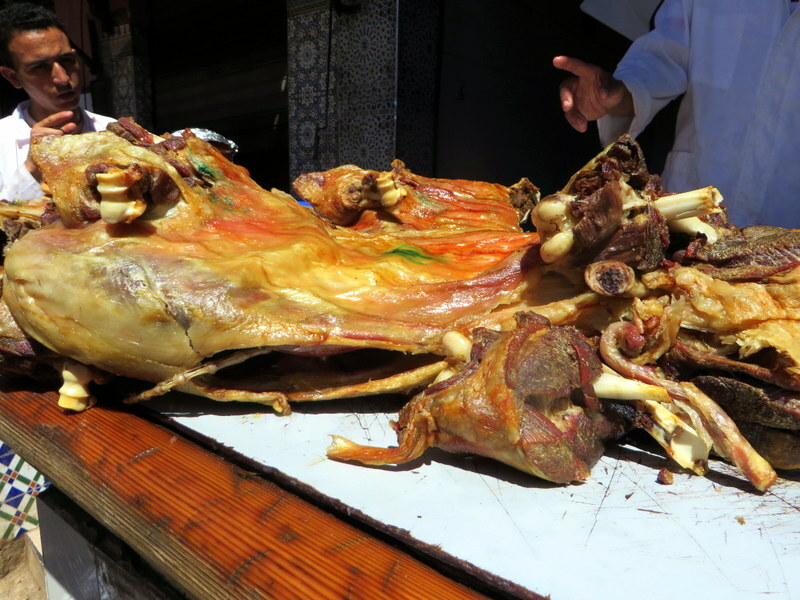 Then, I turn the corner, and I am surrounded by dozens of lamb’s heads sitting on top of tagines. I know this has to be the place. 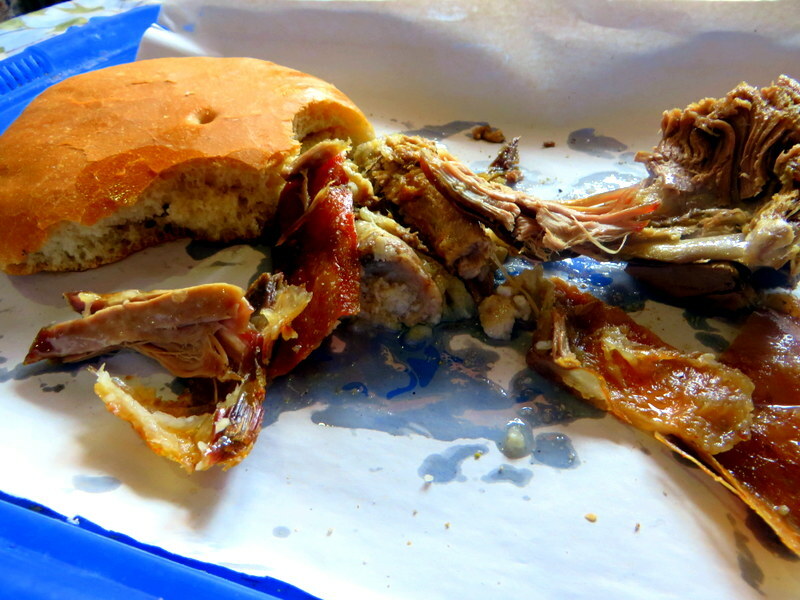 A man at the counter tears lamb apart with his bare hands. I warily look around, as my stomach grumbles louder. There are no other tourists. This is a good sign. “One please.” I say, boldly stepping up to the counter. I am taken to another counter where another man tears even more lamb apart, and he asks me how much I want. I settle for 250 grams (even though I could eat twice that amount), and the man weighs the meat, heaps a piece of bread on top, and there is lunch. I have no silverware, no napkins (a piece of paper-the typical “napkin” in Morocco is brought at the end of my meal for me to use as a napkin), and so I sprinkle the cumin-salt mixture on top and dig in. Grease from the tender lamb drips down my chin as I grin the grin of a hungry woman finally getting fed. The sweet mint tea that is brought is the perfect accompaniment. I eat every mouth-watering bite, and can’t believe how delicious it is. 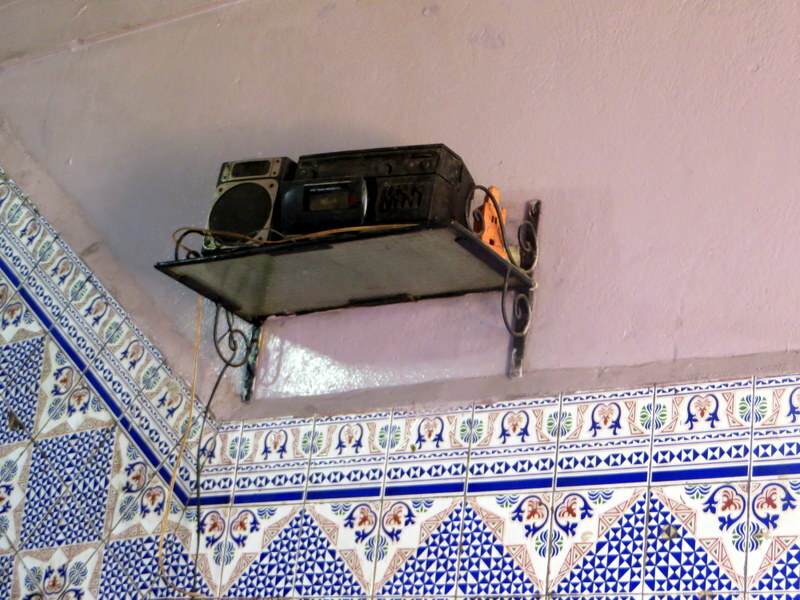 I give all the men watching me a thumbs up, as I listen to the tunes coming in on the old radio. They give me a thumbs up back and proceed to give me a tour of the oven. Several nights later, I pass by here again as a part of the Experience Marrakech: Food and Market Tour of Djemaa El Fna Including Traditional Dinner (a tour that was sponsored by Viator). The men all remember me and greet me with smiles and pose again for pictures. Pastries, Anyone? I Made Them Myself! 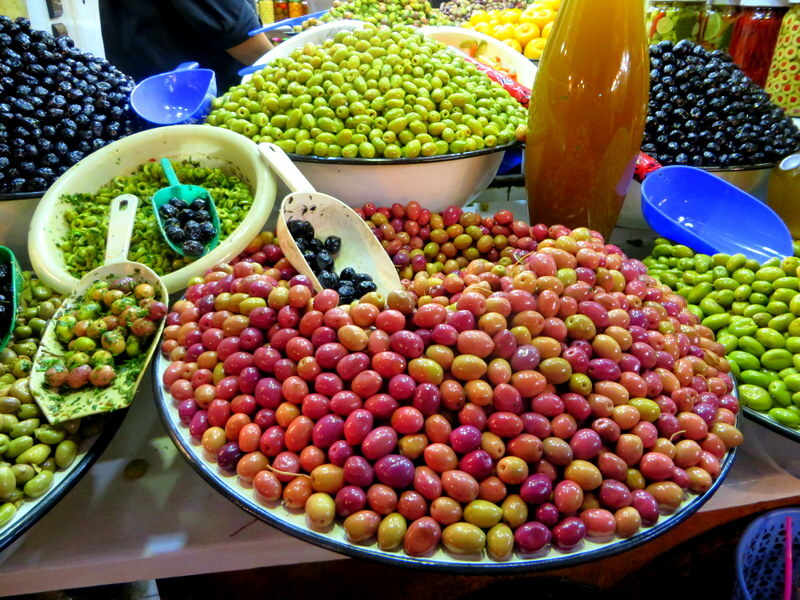 I am disappointed that we won’t be eating street food, as its sizzling smell are making me hungry, but I am given a great tour of the medina and a great history of Moroccan food. 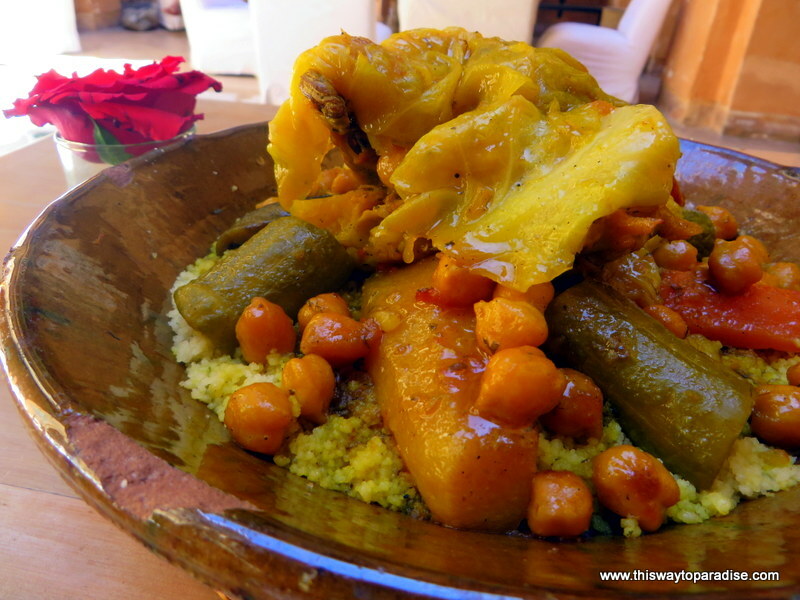 I learn that cooking is the most important thing for a Moroccan woman to learn, and her cooking skills determine her entire success in life. (Success meaning to them, whom they marry). Shortly after getting married, the wife must prepare a special meal for the in-laws. They will present her with special cookies if they think she is a good cook. If they don’t present her with the cookies, it means that tough times are ahead, and she must spend many hours in the kitchen preparing to be a better cook. I also learn that a man can determine his wife’s mood just through her cooking. 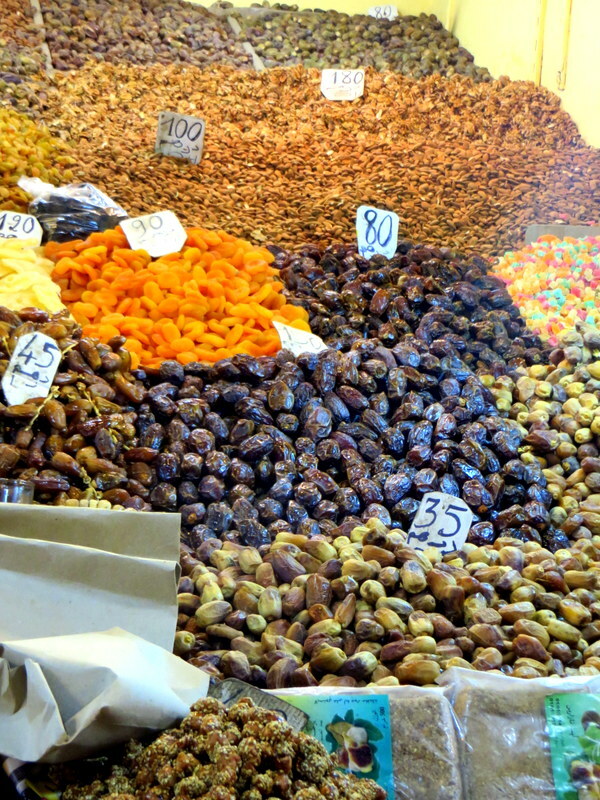 I am shown the many spices that make up Moroccan cooking, and other essential staples such as olives, dried fruits, and nuts. 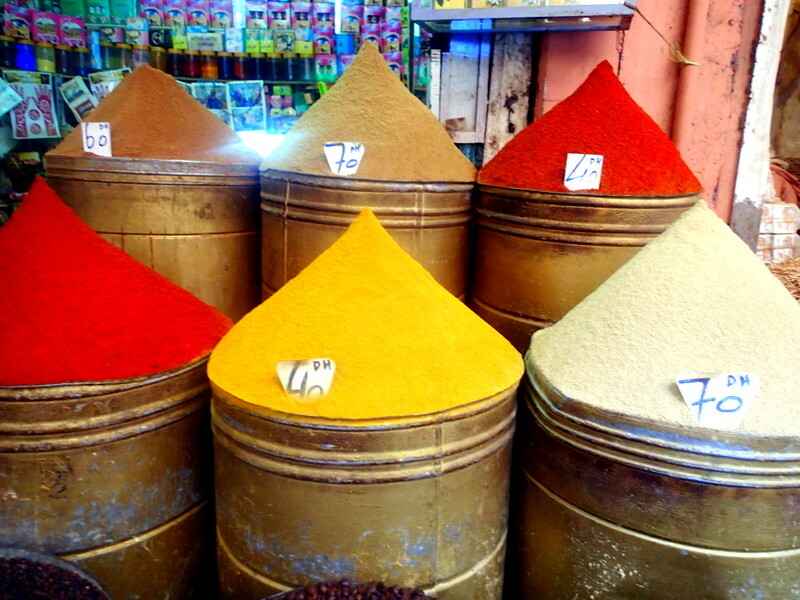 The colors are vibrant,and the fragrance of the spices fills the entire medina with their smell. 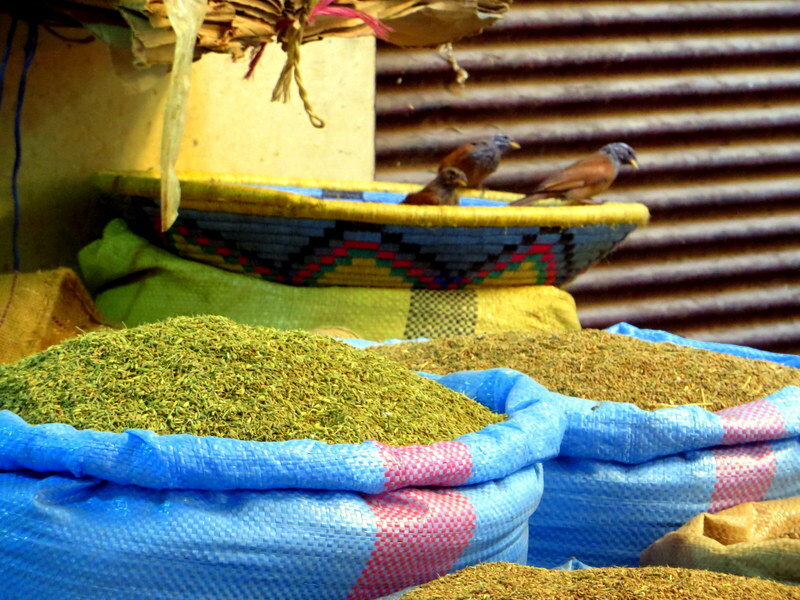 The Birds Like Spices, Too! 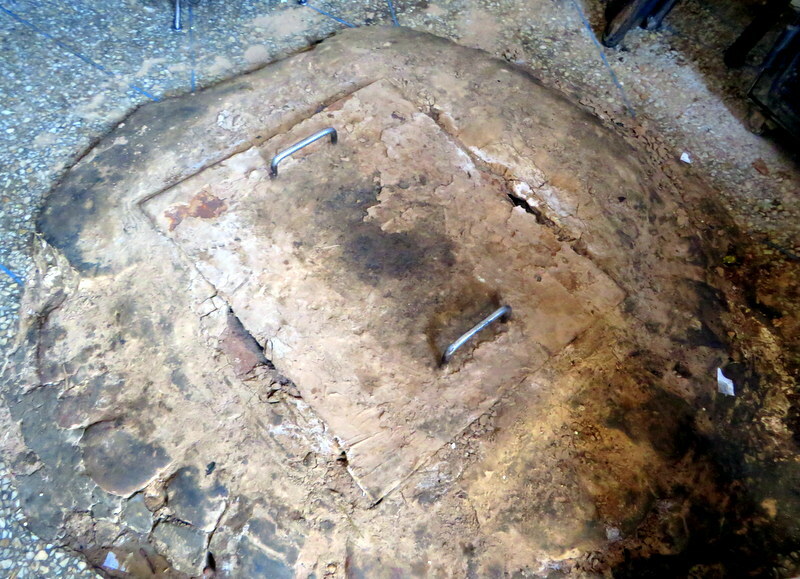 I also visit the local bread oven. 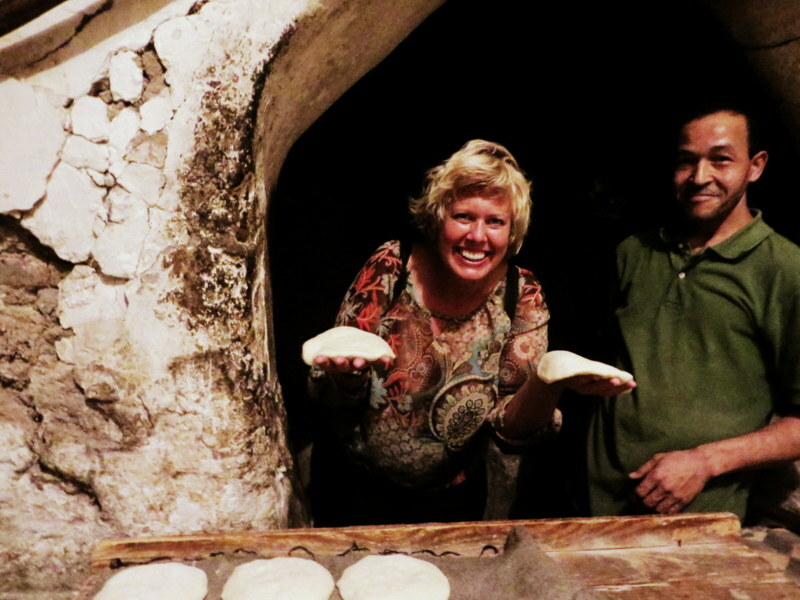 The community brings their bread to a local bread oven, so they don’t have to heat their own homes with their ovens. 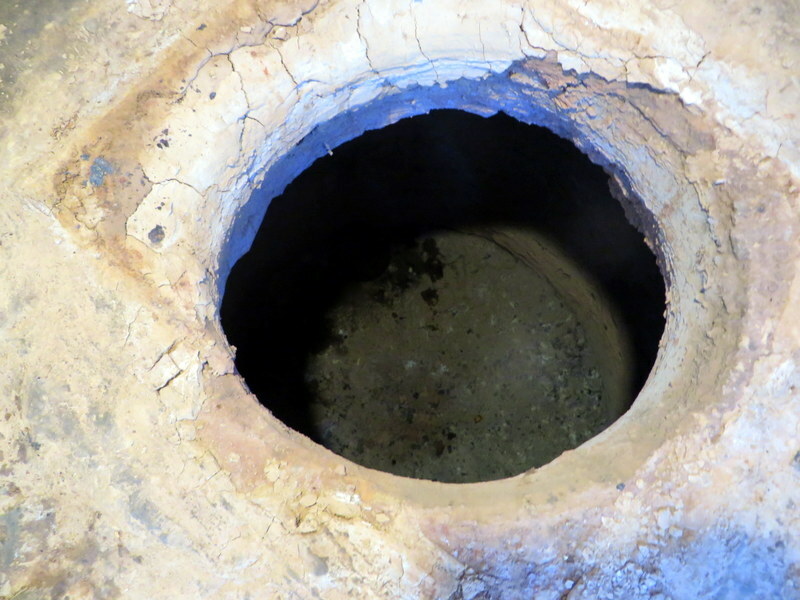 They also like the smoky taste the community oven gives to their bread, as olive wood is used for the fires of the scalding hot oven. Of course, I am immediately put to work when I visit! 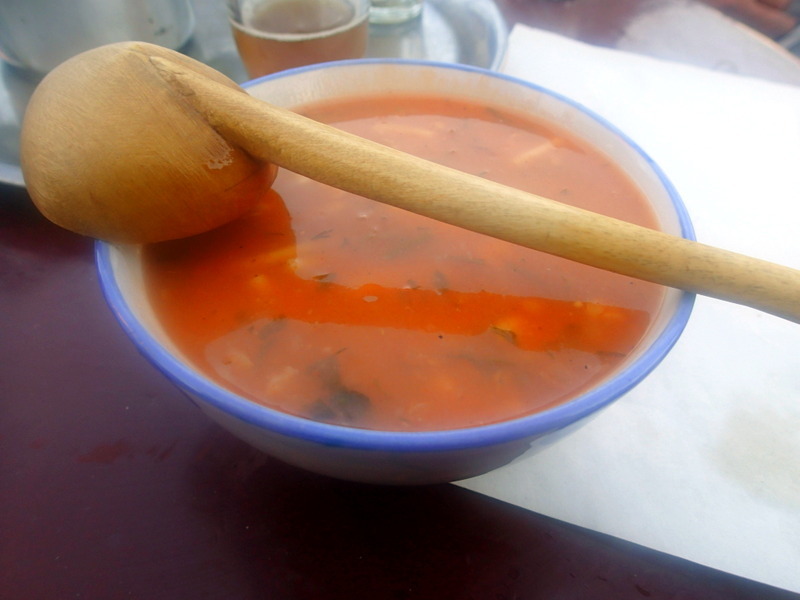 I also enjoy the traditional harira soup which is served during Ramadan as the first meal to break the fast. It is nurturing and flavorful. 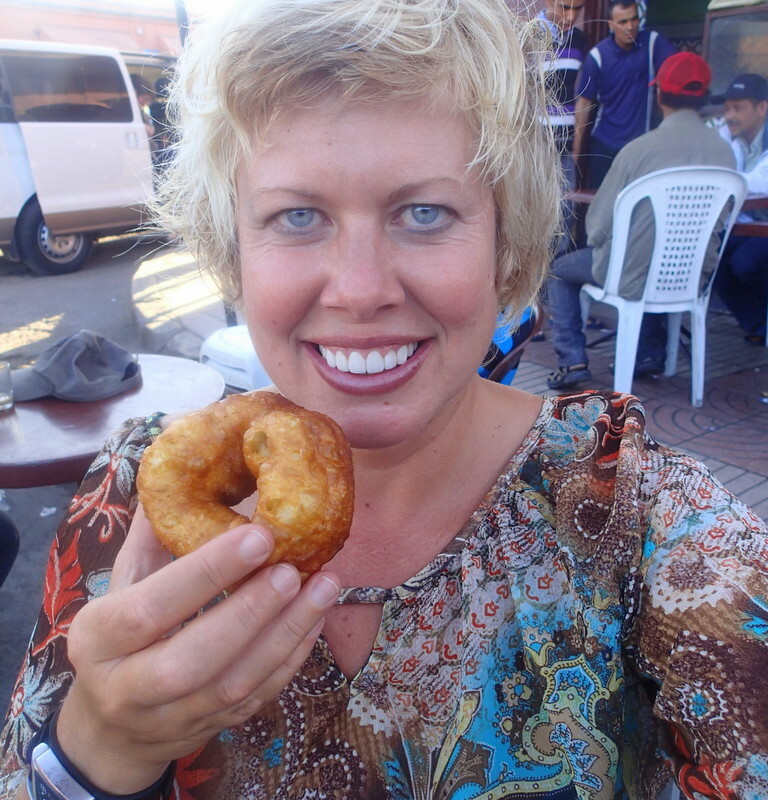 I eat piping hot Moroccan doughnuts served with Moroccan mint tea that is so sweet it makes my teeth hurt. I am the only woman at this local tea shop that is usually just frequented by men. For dinner, I have a very special dish. 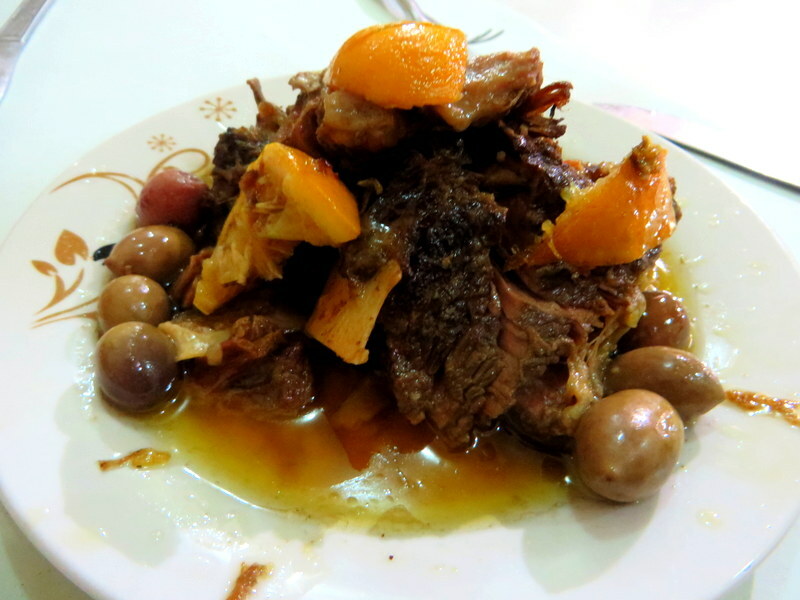 I have beef that’s been slow-cooked in a clay pot for 12 hours with preserved lemons and olives. It is tender and moist. I think of all the work that the women go through just to prepare a meal. I pondered how their entire lives revolve around the food that will be served that day. While I love food and cooking, I can’t imagine living in a world where my success hinges on my ability to cook, and my entire social life revolves around preparing a meal. I said a prayer of gratitude for the freedom that I had. 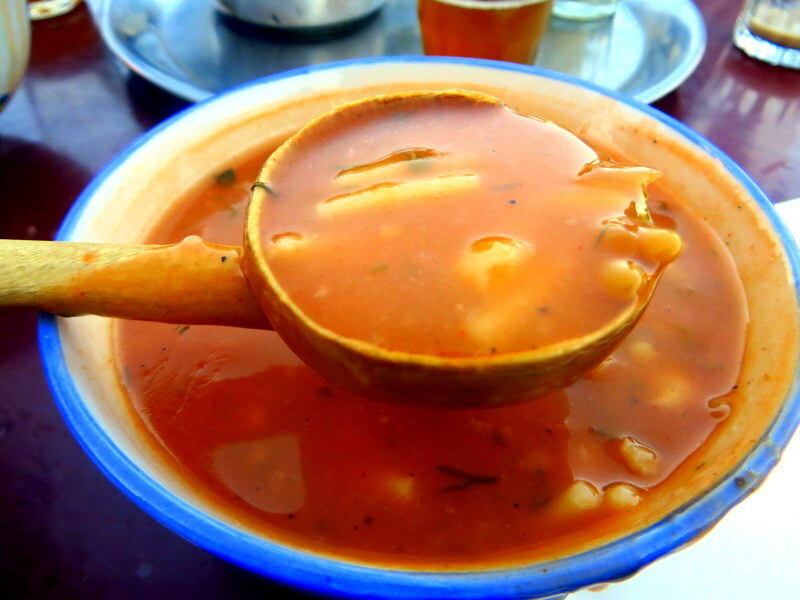 I spend the rest of my time in Morocco, sampling the other tradional Moroccan foods. The tagines, the couscous, the chicken pastilla pie, with its layers of chicken, almonds, phyllo dough, and cinnamon and sugar. But, there is one thing that is still tempting me, one craving that I cannot deny. 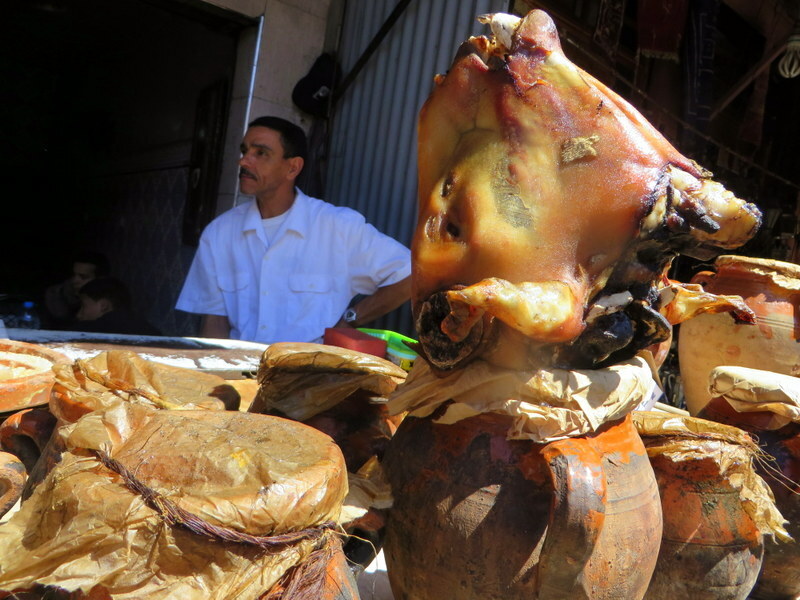 I cannot leave Morocco without tasting its illicit street food for myself. 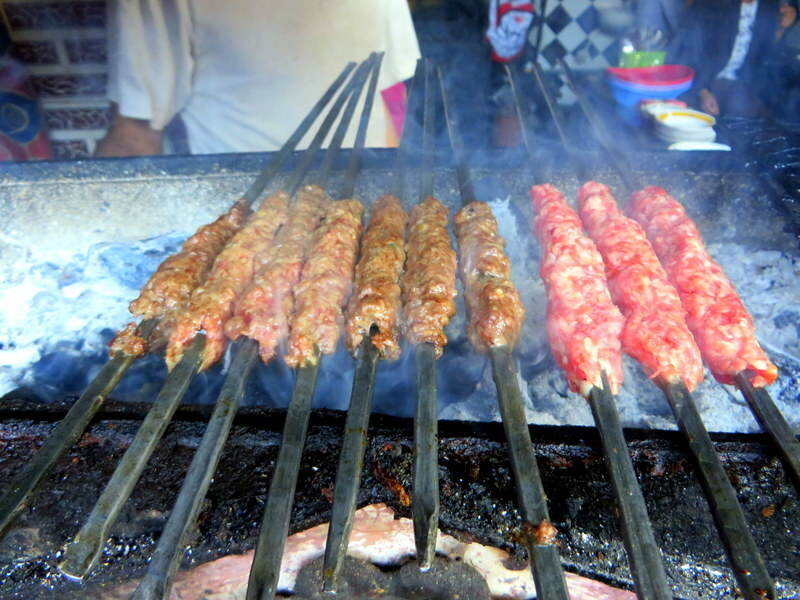 I feel like a kid again stealing cookies out of the cookie jar, as I order the kofta (minced beef) kebabs, as they still sizzle on the grill. I don’t care who feels sorry for me that I am eating alone, or who may think that the reason I am ordering them is because I have been drinking. They are amazing. And, as I stuff the last harissa (spicy chile sauce) coated kofta in my mouth, I can’t help but wonder if street food will ever catch on in Morocco? Somehow, I doubt it. Not with a culture so ingrained in the fact that it’s the woman’s job to cook every meal, and dinner time is a considered a sacred time where the family gathers around to talk and enjoy each other’s company. 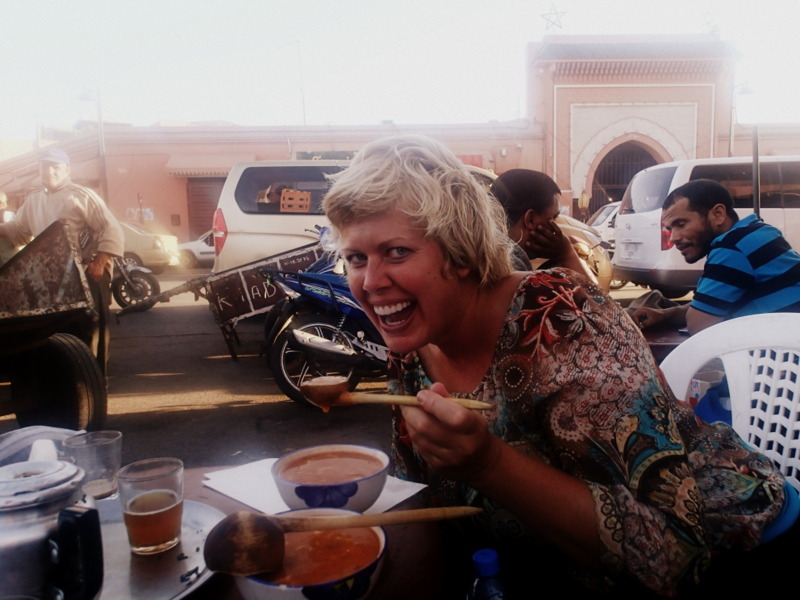 I end my food safari in Morocco, grateful for the tastes I have enjoyed, for the sights I have seen, but more grateful for my freedoms to travel freely, only cook when I want to, and to eat all the street food I can possibly devour. 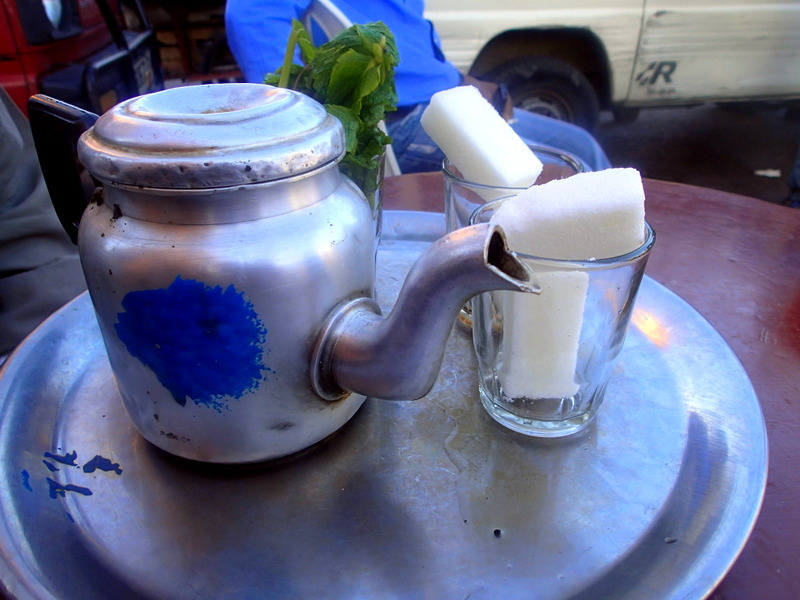 20 Responses to "My Crazy Moroccan Food Safari"
Reading what you said about the ultra-sweet mint tea I found myself thinking, “how sweet could it really be?”, then I see the shot of the glasses with the giant sugar cubes! DAMN! Makes my teeth hurt from here! and I love sweets, heh. That looks fantastic! I absolutely love lamb, so I would definitely be in heaven here. 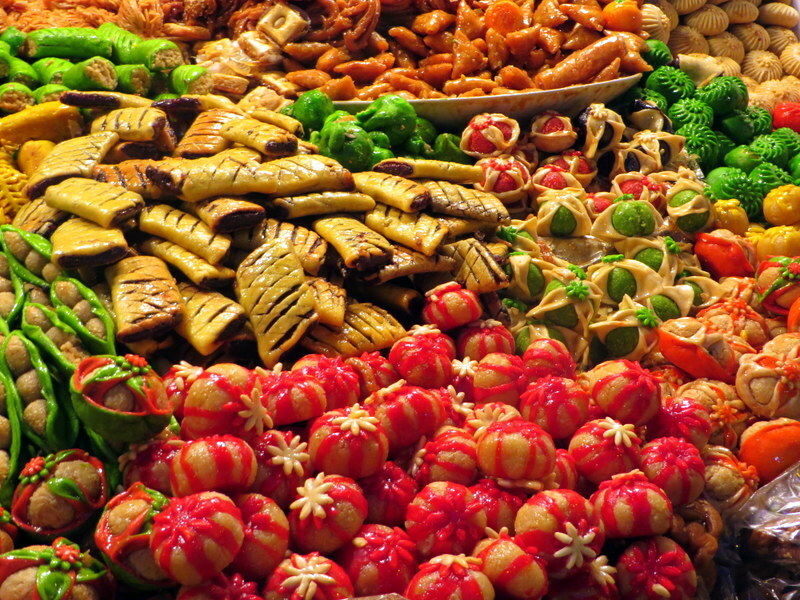 Oh my gosh… The photo of you with the heaps of pastries… I think I would have jumped right into them! Love this post. Lillie – @WorldLillie recently posted…The Most Fun Thing on Martha’s Vineyard: Alpaca Farm! Look so delicious! 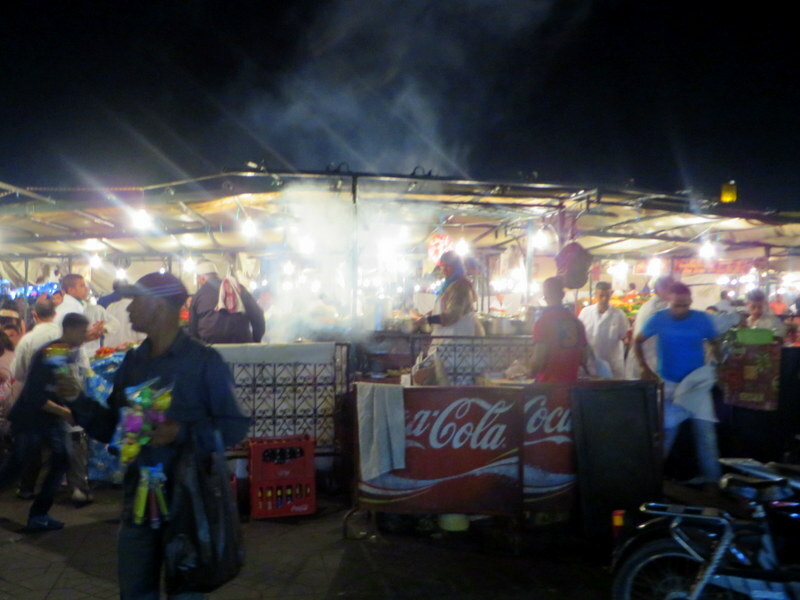 I love Moroccan food, but I actually didn’t know those facts about street food. Good to know, and so interesting to learn about the different cultures! Yes,it was a fun culture to experience! 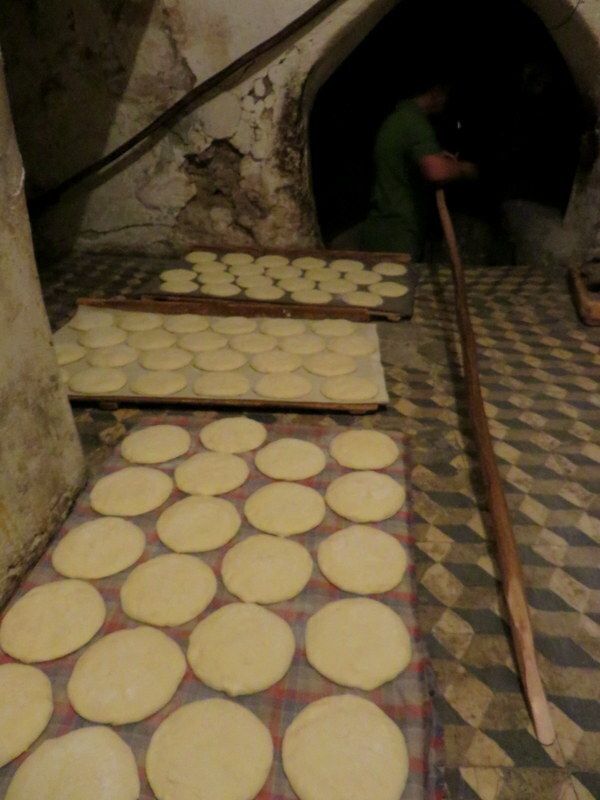 We enjoyed some of the best food we’ve ever experienced on a brief trip to Tangiers. Very veggie-friendly too. Which made a change from our Andalucian holiday. I hope to go there! I’ve heard nothing but good things. Planning a trip to the area and had not heard that about street food. Very very good to know! Great post. Go eat street food = go to hell? Who knew? But those differences make travel so enlightening and fun. Nice post — I love the (literal) mountains of spices, but I’ll pass on the lamb heads. Terry at Overnight New York recently posted…Paramount: And the Tony goes to . . .
Great post Valen! 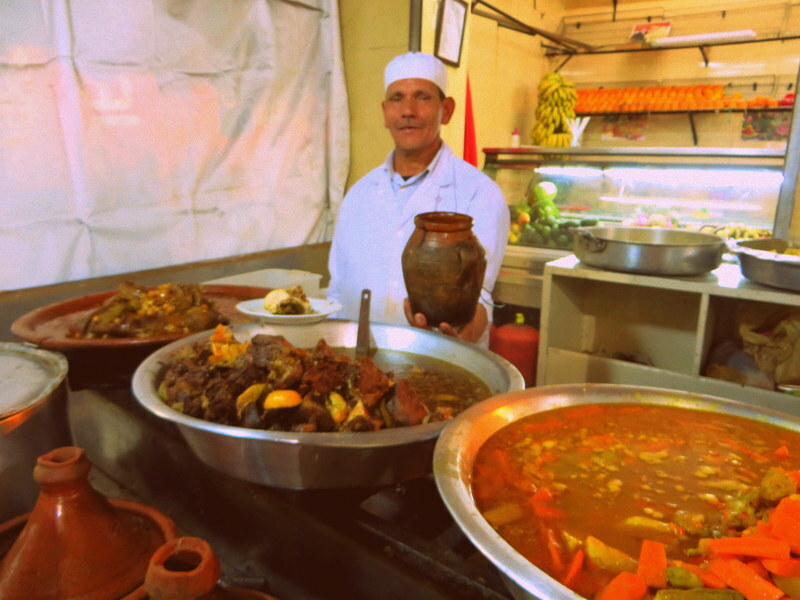 I loved the food in Morocco and, not usually being a big fan of lamb, I was surprised at how delicious it was there. 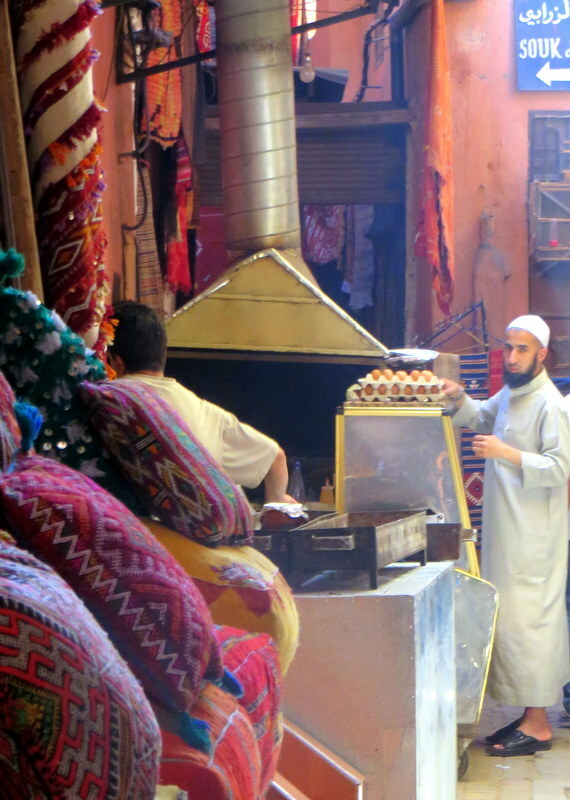 As for the tea, I could drink Moroccan tea all day long I enjoyed it so much. They also don’t get enough praise for their breads. Especially dipping it with a little of the argan oil. Nice shots of the spice piles and the dates and olives. So colorful! Thanks, Charles! Yes, I absolutely loved the lamb and the tea, though it was a bit sweet. And you are so right about the bread, too! I love Moroccan food and especially the sweet mint tea. 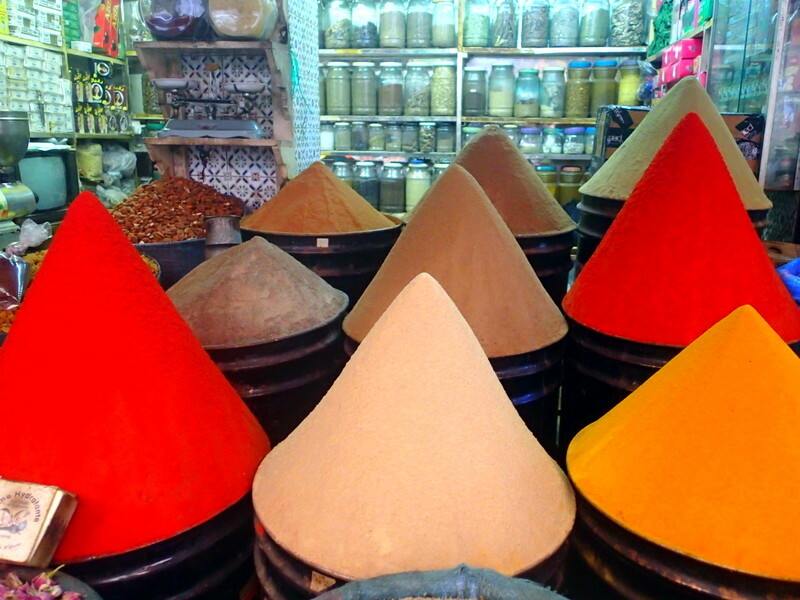 The piles/mountains of spices are amazing! 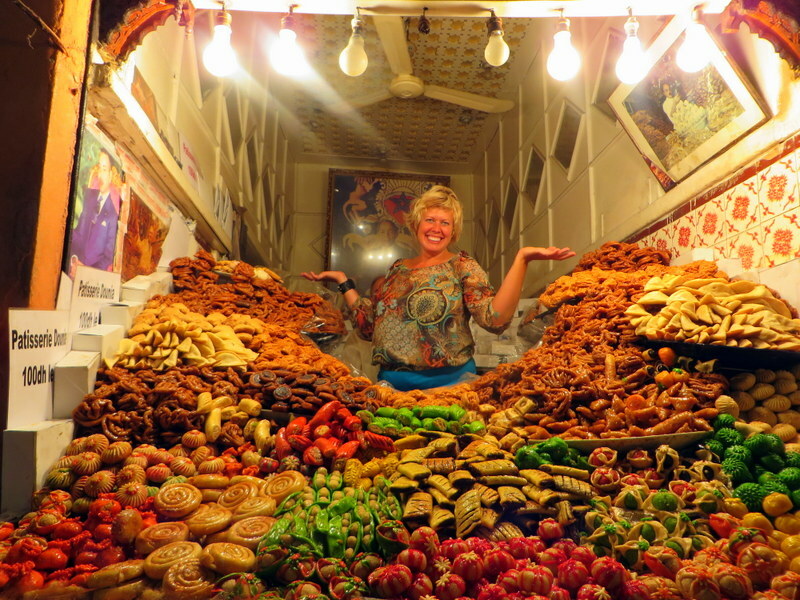 That is a mountain of pastries! 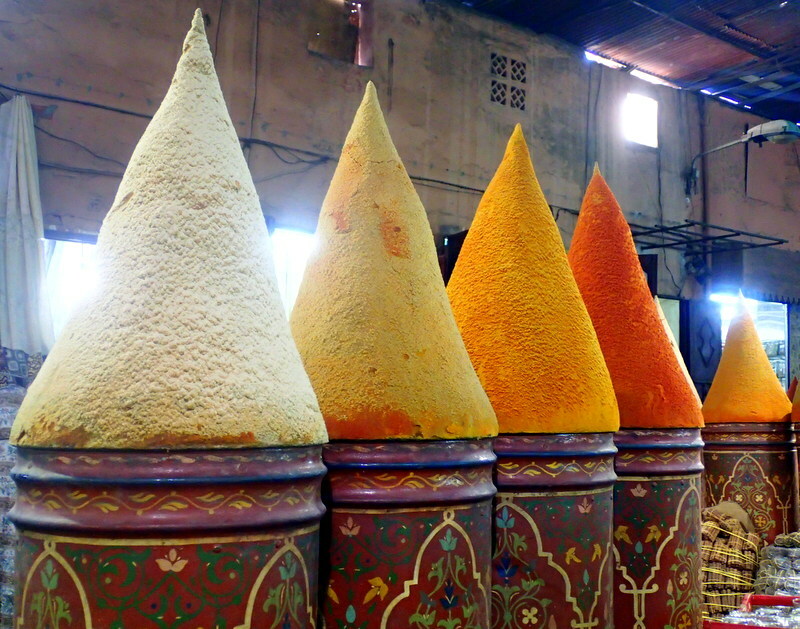 I love the colorful towers of spices too. It all looks delicious! 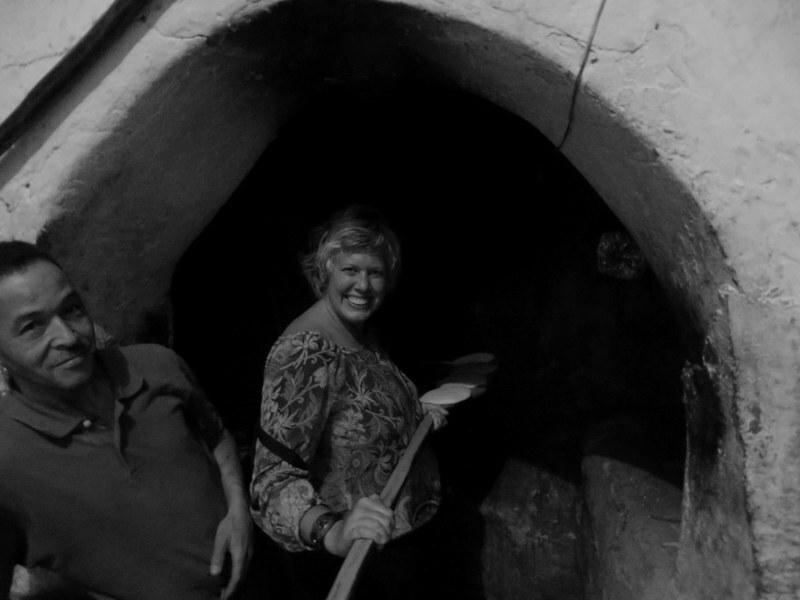 Love the photograph of the couscous dish and Valen 250kg of lamb!!!! I am sure its a typo because that would be a enough to bury it in the ground and eat for the rest of your life. Oops, yeah, meant 250 grams! !